The National Press Club’s home from 1909 to 1914 covered two stories above a drugstore facing 15th St. at the corner with F Street. At one time, one of the city’s great early landmarks, the Rhodes Tavern, occupied this building, and a historical plaque on the current edifice attests to the importance of both the Club and the tavern to the city’s social life. Major newsmakers of the time would just drop in. No formal speeches; they would sit around the fireplace in the Club’s common room to chat with members. Who discovered the North Pole? Both Frederick Cook and Robert E. Perry made their claims to Club members in front of that fireplace. With the windows open, the clip-clop of passing horses and the occasional cough of a motor car mingled with the conversation. On Nov. 19, 1910, former president Theodore Roosevelt, freshly back from his safari in East Africa, dropped in, “bubbling with enthusiasm,” as the 1928 history recounted. He told a story that he was attacked by a lion, who sprang at him three times, and he was able to duck him on each charge. 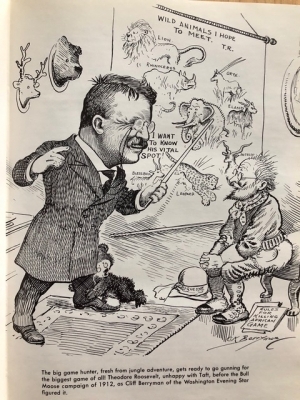 For Taft, of course, things did not go well in 1912 as Roosevelt challenged him as an independent “Bull Moose” candidate and both lost to Democrat Woodrow Wilson. Three days before leaving office, Taft made his final visit to the Club as president, saying he was as able to smile while winning only Vermont and Utah and being able to lay down the cares of office as he was four years earlier when he won. Taft maintained his Club membership, even after he became Chief Justice of the United States. This is another in a series provided by Club historian Gil Klein. Dig down anywhere in the Club’s 111-year history, and you will find some kind of significant event in the history of the world, the nation, Washington and the Club itself. Many of these events were caught in illustrations that tell the stories.